So I joined a follow-up reading group on Goodreads which participants in my recent SF/F class created in order to continue discussing fantasy and science fiction books of note in-depth. The plan is to have one book a month to read and discuss, alternating between works of science fiction and fantasy. 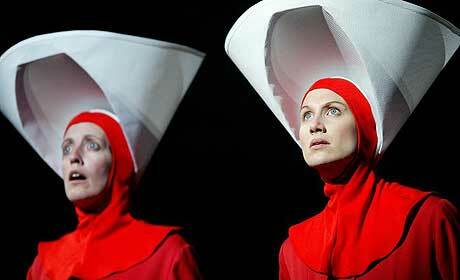 We are starting with Margaret Atwood’s The Handmaid’s Tale for April. Margaret Atwood is well-known for refusing the label “science fiction” for her work. In fact, three decades later I still have trouble thinking of her work as a science fiction; I grew up looking at what my parents — both avid readers — were reading and my mom had all the early French translations of Atwood’s works. My mom has never liked science fiction, ergo, Margaret Atwood didn’t write science fiction! You can view the book online on OnRead.com. It had the distinction of making No. 37 on the American Library Association (ALA)’s list of 100 most challenged books of the 1990-1999 decade, but dropped to No. 88 in 2000-2009, woo-hoo! You can read many of Atwood’s works: books, short stories, essays, articles, interviews, as well as reviews or her books, etc. on Unz.org. The discussion of the book’s motifs on TV Tropes is worth browsing. I think it’s fair to say that as a place to live in, the Republic of Gilead sits as far as it can from Charlotte Perkins Gilman’s Herland. There is a 1990 movie starring Natasha Richardson as Offred, Faye Dunaway as Serena Joy, and Robert Duvall as The Commander; the link has the entire movie with original English audio but German subtitles on YouTube. A dramatic adaptation of the novel for radio was produced for BBC Radio 4 by John Dryden in 2000. Listen online to Part 1, Part 2, and Part 3 of 3. There is even an opera by Danish composer Poul Ruders; you can sample and buy tracks here. From what I can see, the visuals in the English National Opera’s production were very dramatic even if the music got lukewarm reviews from critics. Someone used Storify.com to make a sort of visual summary of the book using images from edition covers, stills from the 1990 movie, and images of the opera productions. I think it’s fair to say that Atwood’s book had far-reaching influence, even in unabashedly entertainment-oriented science fiction. Gilead is a dead ringer for several dystopias in later books, like David Drake’s Protectorate of Grayson (the redeemable version of Gilead) and Masada (the hard-core version) in his Honor Harrington series; and Elizabeth Moon’s New Texas (known in our household as “the Space Stupids”) in her Familias Regnant universe. 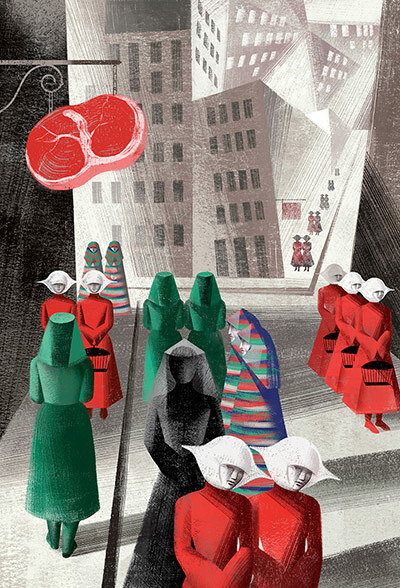 An interesting perspective from a self-described Mennonite feminist, The Femonite: The Handmaid’s Tale – Atwood and Feminism Then and Now. Once again, I’m going to mention the game Shock: Social Science Fiction (Glyphpress), which is a fiction game of culture and future shock. Based on the works of masters of speculative fiction, the game pushes the players to make stories that matter to them — stories about politics, philosophy, love, and death. It is a very good way to re-create a story in the style of Atwood’s various thought experiments. Top illustration by Anna and Elena Balbusso, winners of a Gold Award from The American Society of Illustrators, for the Culture Label deluxe edition. No copyright challenge intended. Photo of English National Opera’s production of the opera version obtained from The Guardian UK. No copyright challenge intended. Posted on April 12, 2013 July 27, 2013 by mechanteanemonePosted in books, fictionTagged books, fiction, gender, margaret atwood, movies, music, radio, religion, scifi, social, society, writing.